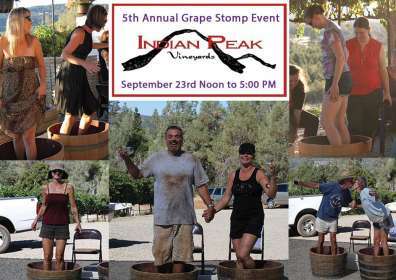 Indian Peak Vineyards Celebrations its 5th Annual Grape Stomp Event this Saturday, September 23rd​ from Noon to 5:00 PM at the Indian Peak Vineyards Winery, 31559 Forward Rd., Manton, CA 96059​. 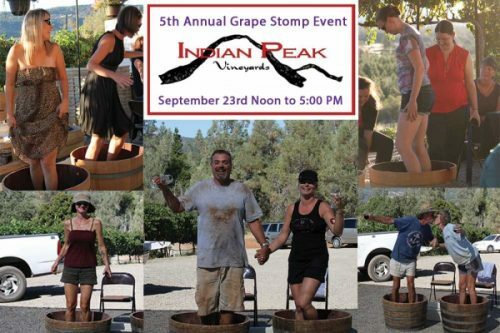 Manton, CA – Indian Peak Vineyards is celebrating the 5th Annual Grape Stomp Event, taking place this Saturday, September 23rd from Noon to 5:00 PM at the Indian Peak Vineyards Winery, 31559 Forward Rd., Manton, CA 96059. This event commemorates around thirteen years in the winemaking business and is another milestone for the Winery located in the mountain community of Manton, California; Northern California’s Newest American Viticultural Area (AVA). This event focuses around the “Pigeage”, which is the French Winemaking Term for the traditional practice of stomping barefoot and crushing grapes within open fermentation barrels to release the grape’s juice. This long-honored tradition immediately follows the grape harvest and was a necessary aspect of the traditional winemaking process. The entire family is invited to participate in the grape stomping experience and the “foots-on” segment of traditional winemaking or vinification, which is the overall process for making the wine; from selecting the grapes, crushing the grapes to extract the juice and then fermenting the juice in large wooden oak barrels. Other produce is often added by the Master Winemaker to create the unique flavors found in the finished bottled wine, yet without the grape stomping juice extraction process, there would be no juice for the traditional winemaker to make the wine. Attendees are invited to join the Vineyard Tours, visit the Wine Tasting Room, have some great food and become part of Traditional Winemaking History by participating in the 5th Annual Grapes Stomping Event’s activities at Indian Peak Vineyards Winery, 31559 Forward Rd., Manton, CA 96059. Indian Peak Vineyards was started in 1998 by founders Fred and Donna Boots and became Manton’s first Bonded Winery in 2004 producing commercial crops in 2006. The Indian Peak Vineyards Winery is located south-east of Redding, California in the town of Manton. The Manton Valley AVA is the home of Northern California’s American Viticultural Area (AVA) unique to the local climate at 2200 hundred ft. elevation which allows the fruit to enjoy the +100° temperatures during the day and cool evenings from the breeze that comes down from Mt. Lassen. The unique volcanic soil composition and minerality contribute to the uniqueness of the wines produced here. Daily Wine Tasting Sessions are open 11am – 5pm with short commutes from Redding and Red Bluff, CA. Indian Peak Vineyards is owned and operated by Fred and Donna Boots of Manton, California.